First three - early racing motor cars, all are driven by internal combustion engines. 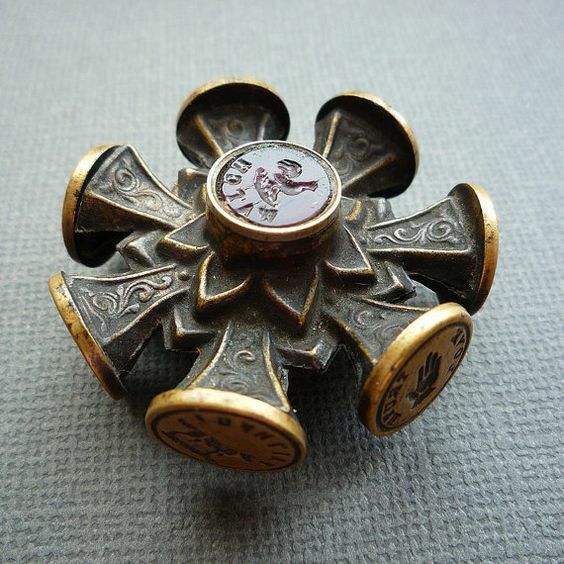 All probably date from the first quarter of the twentieth century. 12. 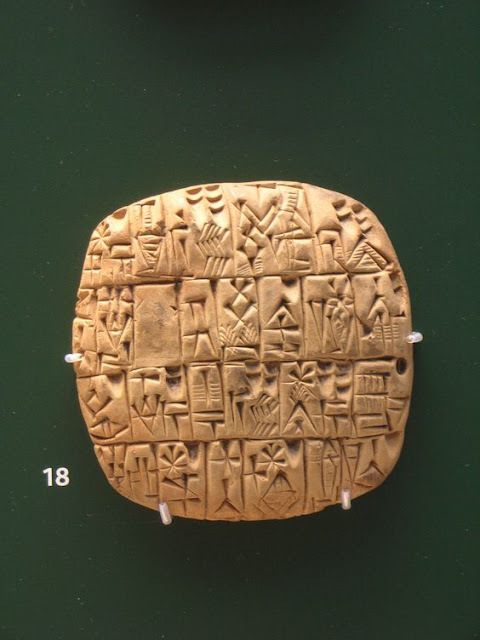 Fired clay cuneiform recording tablet. 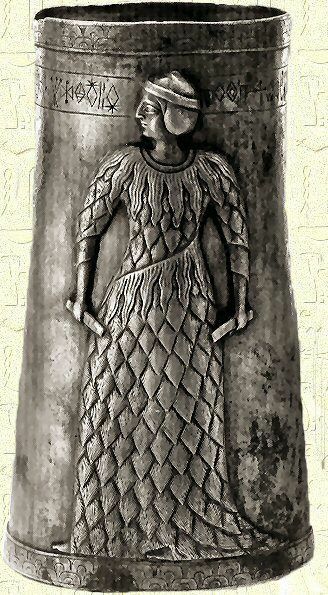 Dating from 2,000 B.C. or earlier. 1. 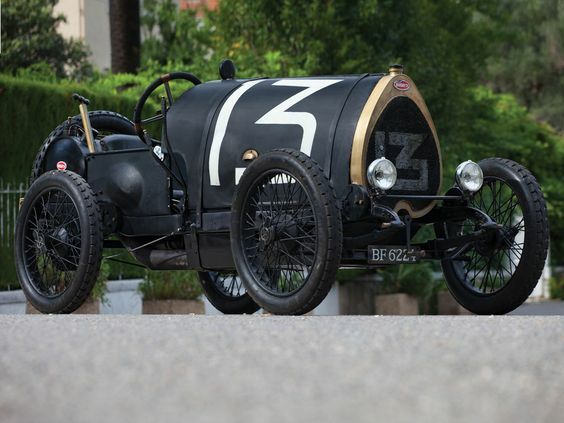 1905 Darracq 200h.p. 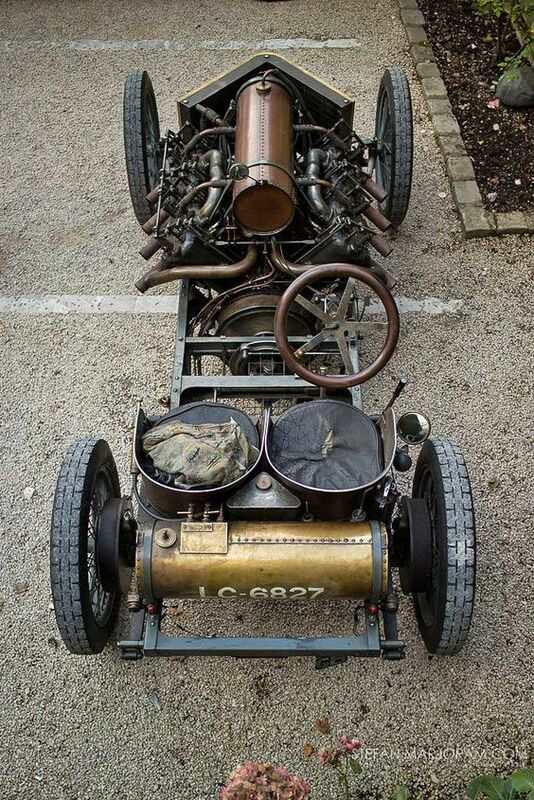 Land-speed record car. 2. 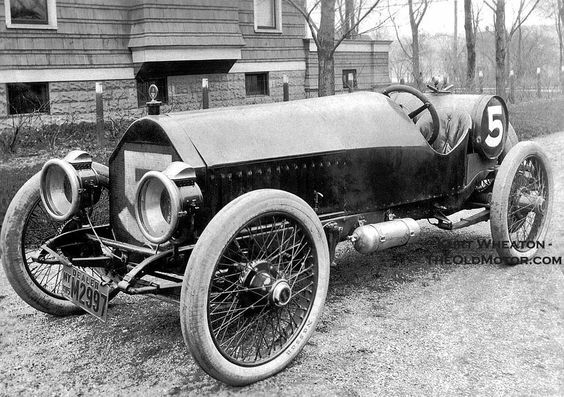 1914 Chalmers racing car. 12. Yes, translated as 'The instructions of Shuruppak' and considered to be the origin of the ten commandments circa 3000 BC. Well they are 'Writ in stone' but I didn't know Moses had the surname Shuruppak! Very 'refeened' loo pull handle. Enamel - can't remember the name of this sort of enamel. Nmae might pop up later. 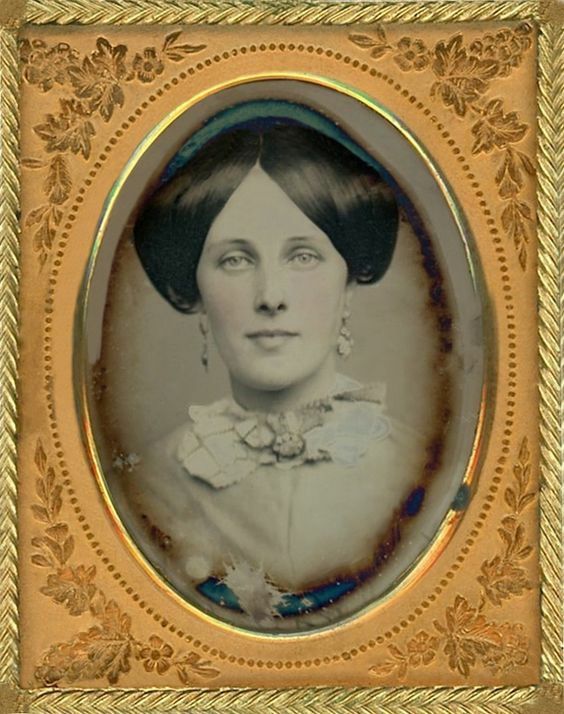 Early/mid nineteenth century. Sorry - above refers to number 10. 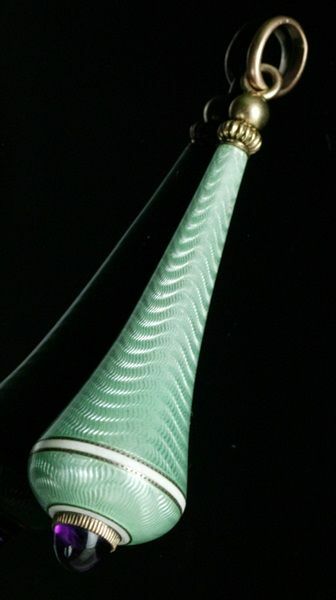 (10) Guilloche enamel (I think). Name just came to me. Not much wrong with my memory; it's just the retrieval system that seems to be a bit slow these days. 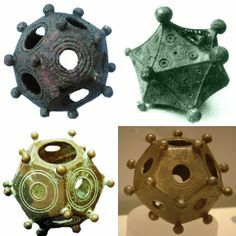 (14) I think it's called a 'pomander'. Each of the segments contains different scents or spices. Probably French, silver, 16th/17th century. 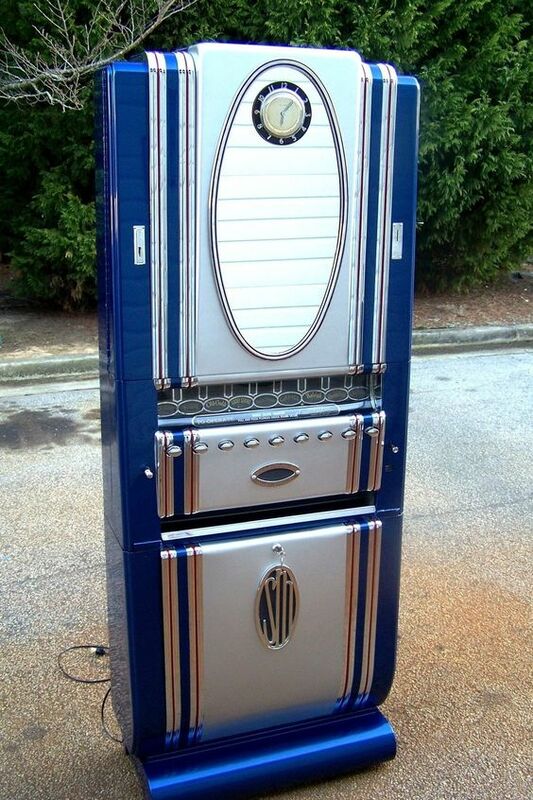 Yup, isn't it an absolute delight of the craftsmans skill. Hot stuff Mike, the enameled light-switch pull (10) is by Fabergé. I'll give details of the speedsters marques in a day or two. Did you notice item 16 was commissioned by one of Ann's inverted relatives? Knew one of them ended up down under. Not, I think for the usual reasons, i.e. not as a guest of H.M. Queen Victoria. Can't remember details. There may be a mention of it in John Peck's diary. I think it was his brother or one of his sons. Lucy may know, although I doubt she's had time to read the whole thing. Hugh Peck and his wife Emma Maria née Buswell with two of his brothers George and Edward sailed together for Melbourne, Australia aboard Brunel's SS 'Great Britain' (launched 1843) in 1852. ( the longest passenger ship in the world at that time.) 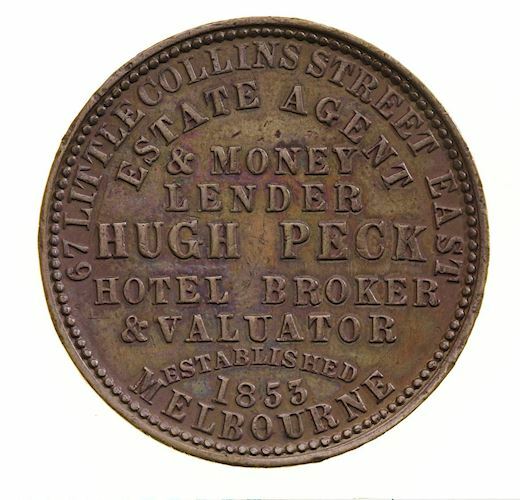 Hugh Peck had brought (borrowed) money with him and therefore was immediately able to open his own wholesale hay and corn store in Fitzroy, which was then regarded as being a long way from the city. In 1853 he wound up the hay and corn store and took up business as 'speculator, auctioneer, and house and land agent at 67 Little Collins Street. He later moved to offices over the Commercial Bank in Collins Street and then to his own premises in Queen Street. Emma & Hugh had 4 children, the eldest was born in Melbourne, Australia in 1852 and that line continues presently and is in contact with some of their UK relatives. Is number eleven Lily Langtry, the Jersey Lily ? Good looking gel whoever she is. If it's Miss Langtry she was wasted on that overweight booby Edward VII. Might be her mother Mike, she has the look, but this portrait dates to 1856 ~ it was the type of portrait rather than the sitter that I intended as the curio. Yo iz Ssssmokin' Rog ~ But a machine delightful enough to make me take up the wicked weed again. Of course it wouldn't work nowadays being coin operated; the coin-box would be full before you got all your money in considering the price they are now. 11. A dageurotype(?) but I'm not good on modern technology. Yo iz a godown spiffy hep-cat Bro an all dat modin jive-talk ~ it is indeed a modern device of the kind you mention. Ref Hugh Peck and his descendants. In fact we met some of them at a Peck family get together a few years ago in Wisbech. Great family for getting together, Ann's lot. Don't know why we Horners don't do it more often. I think it might be that we only realy like to socialise with our immediate ancestors, siblings, and descendants, regarding all the rest of our family with a slight suspicion of being a bit hairy hocked. 9. 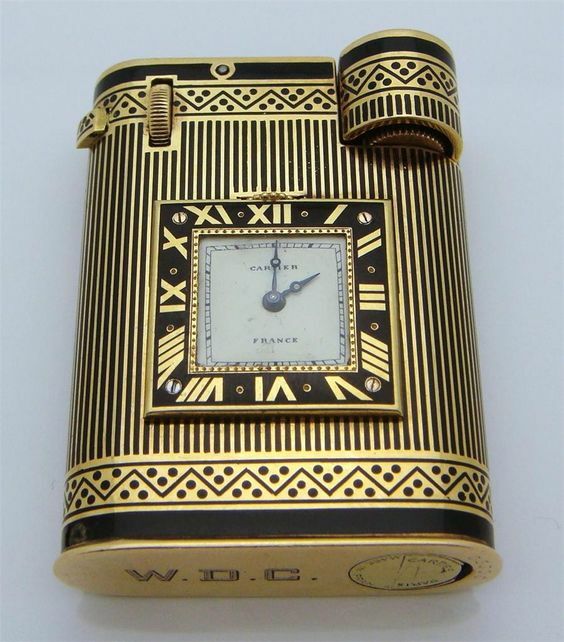 A Cartier cigarette lighter with time-piece. 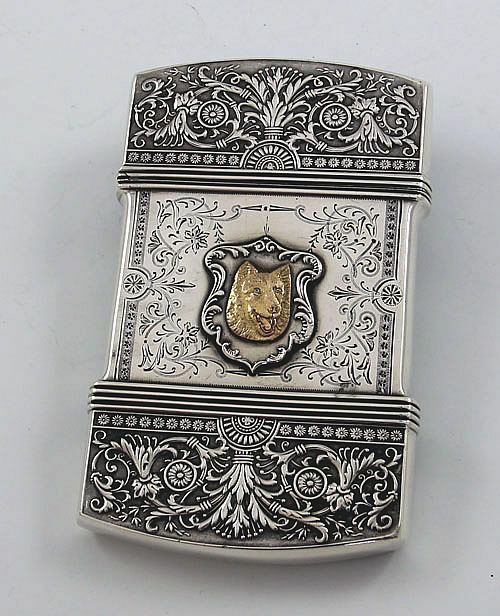 I am deeply concerned that no-one had a stab at No 7, the Imperial Russian SNUFF BOX. 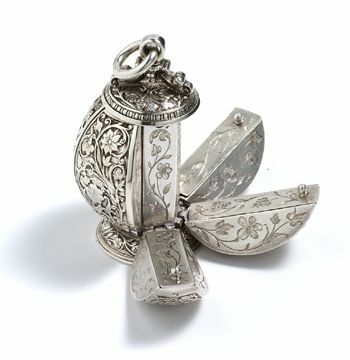 I thought you all knew snuff boxes were de rigueur. (7) Oh, alright then: Number 7, is a snuff box, mainly gold, with guilloche enamel panels in dark blue, and occasional diamonds. 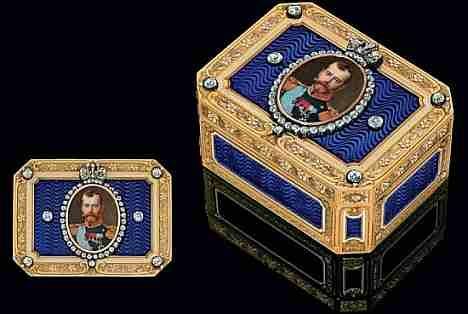 It has a Romanov portrait panel to the lid. It is probably by that Russian firm who made jewelled eggs for the royal houses of Europe to give to each other as presents. Faberge - got it! Around the year 1900 - 1910. P.s. Never felt any desire to deal in them, thank The Lord -couldn't afford to anyway. Swapsies for swankpots. But been shown a good many over the years - lovely things, but not serious artifacts. Sour grapes? Don't think so; as I said, they don't do a lot for me. Know what you mean Mike, I respect the kosher BLING, but it don't lift my heart like a serviceable plug bayonet; I guess I prefer craft to art, realism to hedonism. Not that it ain't a serviceable snuff-box, I'd just be scared to use it in case I dropped it when I snoze. 5. 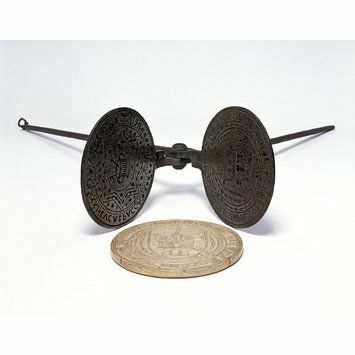 A wafer iron for impressing the sacred host.